How to add request URL Template Parameters to my Azure API operation 2017 version to make it more user friendly? 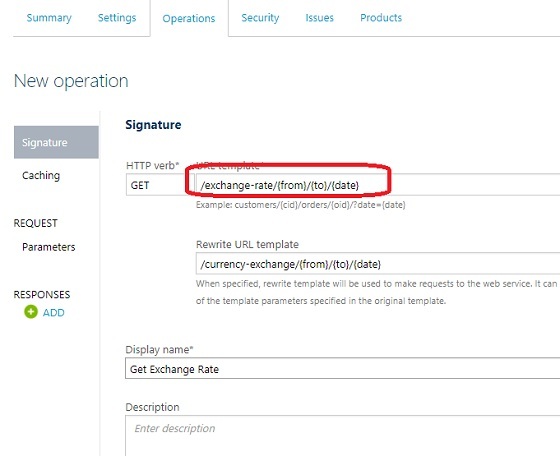 If your API Operation requires some key parameters, you put them as template parameters in the URL template of the operation. Using template parameters reduces the need for providing parameters in the request body and simplifies the request. If you want to build an API operation to returning the exchange rate of given currencies, you need 3 input parameters from the request: from-currency, to-currency and date. 1. Go to the publisher portal of the API Management Service. 2. Open the "First API" and add a new operation "Get exchange rate".